Fallen Flag is a group of takers in Trabajo, an enclave located in a train yard in Greeley Colorado. They know this must be their last year on the job. They have to save up enough bounty to pull off the score of a life time, the engimatic “Two Banners”, or die trying. This is the story of that last year. Meet Half Off, a negotiator with prosthetic limbs and a broken family. Amu, a former photographer turned hardened warrior. McCready, a latent melee specialist trying to connect to his normal brother. Refurb, a falconer and tech expert. Han, a man of few words and guardian of a young orphan. Cutty, a talented doctor and fanatical cultist. 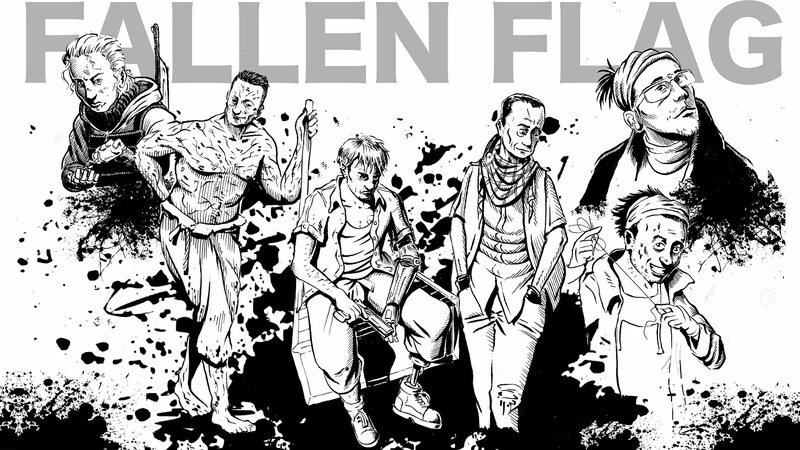 Meet the crew of Fallen Flag. Learn more about the enclave in this thread on the RPPR Forums. Episode 1: A score to loot fuel from an abandoned fracking site turns weird. Episode 2: What seems to be a simple delivery job of cooking oil has an unexpected complication. Episode 3: The enclave needs sensors, which are conveniently located in a nearby school. Why hasn’t anyone looted the school before now? Episode 4: A gated community must be secured, but the squatters inside have nowhere to go. Episode 5: Escorting a group of refugees through the wasteland is dangerous and pays nothing yet the crew will do their best. Episode 6: A cache of cargo drones is waiting to be looted but the crew isn’t alone in the woods. Episode 7: The train of Trabajo leaves to trade with distant enclaves. The crew finds a job to locate an engineer but things are never simple. Episode 8: A daring raid on a black site to rescue a prisoner pushes the crew to their limit. Episode 9: The crew can sell a huge cache of data but they must do so in secret while other takers search for them. Episode 10: The train travels to another enclave but the crew must do what it takes to keep their secrets. Episode 11: A family needs takers to protect them from bandits. Episode 12: The time for Two Banners has come. The crew makes their preparations and says goodbye to their dependents. Episode 13: The Battle for Two Banners. Epilogues. Campaign post mortem: The players and GM discuss our favorite moments and character arcs.